Cut bamboo according to size, this is often called going. And some more made frames or poles. -Voice of bamboo when clashing with other objects. - The sound produced when the hole is closed. Make pole, Frame and pole prepared in accordance with type san size. To be able to produce good quality angklung, tube and frame soaked in a special safe liquid, Once ready then tube dab order in the air-aired. 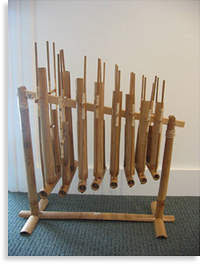 When it is dry, sat and tied with rattan, then be a musical instrument called Angklung.